Adara and Tom’s wedding is simply beautiful. The couple were deeply inspired by natural beauty, something I myself have a huge appreciation for and this certainly reflected in their ethereal style wedding. 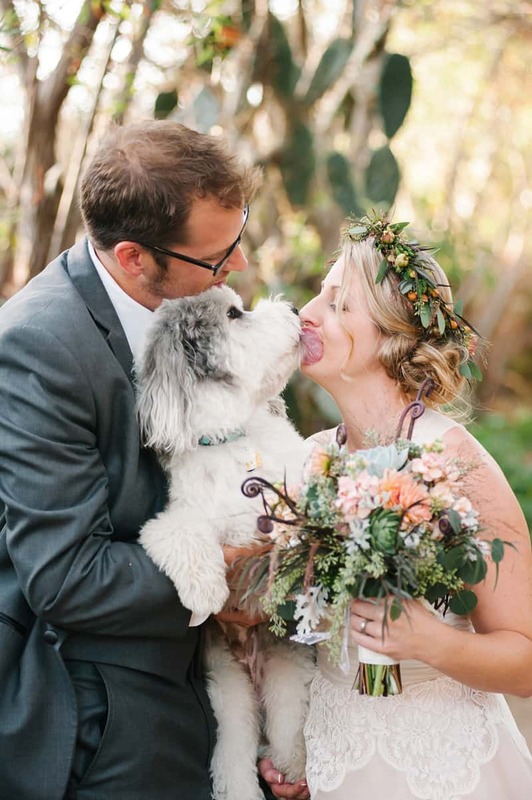 The brides floral crown, her barefeet, the handmade wedding arch, the natural beauty of the venue and the fact that the couple invited their dog to be part of their special day, are just some of the details that made this wedding one of my favourites of this year! I also love the that the couple totally embraced the naturally rustic surroundings for their portraits, who would have thought some old beaten pianos would make such a beautiful accessory…. Adara: We fell in love at a little music festival held in the desert called the Joshua Tree Music Festival (if you ever get chance you must check it out!). Ideally we would have liked to have held our wedding there but couldn’t get all of our friends to go, so we decided to bring the best parts of that festival to our wedding. The Fire Garden is a unique event location located in Bonsall, CA. Created by owner Tony D’Aula, this venue features incredible art installations surrounded by the beauty of nature. As the title suggests, those art installations revolve around fire and light and as day gives way to night, the venue comes to life under the starry night sky. In addition to the beautiful art and natural beauty, the venue offers a flexible approach to putting together your big day. We were able to bring in a live band, a catering truck and the site allowed our dog to be a part of our special day. We used the natural décor of the Fire Garden to inspire the theme. We used Farm Tables and More for our linens, table and beautiful lighting. We had additional eclectic chair rentals from Pow Wow Rentals and added lanterns, candles and succulents around the tables to keep it simple and rustic. I loved how the florist incorporated the succulents into our decor, it sewed together in such a beautiful way throughout the venue and really made everything pop with life and color. I wanted the theme of natural beauty to reflect in my wedding dress. I fell in love with an Amy Michelson dress, it had a beautiful mixture of lace and a soft and flowing skirt. I also liked the neutral colors and the fact that it wasn’t white. I did my own makeup because I was going for a natural look and wanted to feel like myself. My hair was simple and centered around a flower crown – I just never pictured myself in a veil. I decided to go barefoot for the wedding, it felt more comfortable, more me. So instead I wore some beautiful jewellery around my feet that was provided by Sedra. Tom had a bit of nightmare with his outfit as the company who provided it, forgot to include the trousers. How could you forget to include the trousers? Needless to say he won’t be going back! Tom: The very first detail we chose for our wedding was our band, a good friend of ours- Leroy and the Bad Bad Browns. Even to this day our guests still comment on how amazing the band were. They played hits that everyone could dance to and nothing that was sappy or “wedding singer” style. Our cake was one of the most incredible parts of our wedding. Master pastry chef Kim Krane created a one of a kind cake and made it gluten free for the Adara. I am not sure any of the guests knew that it was even gluten free but it tasted amazing! We hired MiHo Catering who served incredibly delicious eats from a food truck. This is one of San Diego’s premier food trucks, it is in such high demand, they only do catering as of 2014. We served burgers, bon mi’s, fries, watermelon, feta & mint salad, everyone raved about it. Forget the rubber chicken plates, go for the gusto! We were adamant that we go with Molly of Luminaire Images, not just because she was an old college friend but because her work is second to none. I honestly was blown away 100x by the caliber of the her work. The final images are incredible. Additionally, she provided a photobooth for both the night and day, it was better than anything I have ever seen and captured our quirky little wedding perfectly! Our wedding really was so special to us and we got to share some wonderful moments together on the day. We met just before we walked down the aisle, which was amazing as we had a tender moment before any of the guests saw us and it will always stand out in mind. Might have helped that we also took a swig of whiskey with our bridal party before hand too! We have a couple of pieces of advice for couples planning their own wedding. First I would say go for a smaller wedding. Next I would say buy way more booze and glasses than you think you need and my advice for on the day would be, try not to worry about anything it will all fall into place. I am so in awe of all the beauty that surrounds this wedding, I would love to visit the Fire Garden, doesn’t it just look amazing. I wouldn’t getting me some of that gluten free cake too!